The cane toad battle is far from over. It is vital to ensure hands-on efforts to thwart the cane toad’s invasion into Western Australia are on-going. Though the toxic pest breed and spread in the tens of thousands, adopting a no hope attitude reflected by the WA Government this week mirrors the inaction Queensland adopted for seventy years!!! Our native animals do no have a toxic history of the cane toad poison excreted through glands on their head so are all extremely vulnerable to the pest. Regional Conservation Manager for the Department of Environment and Conservation in the Kimberley, Mr Gordon Graham, says that there are no known extinctions of plants or animals in the North West Kimberley region at present but this will certainly change if the cane toad gains access. Shadow Minister for the Environment Steve Thomas says the incredible work done by the Kimberley Toad Busters has long been taken for granted by the State Government, but the latest contribution by Mark McGowan and his media spin doctors in the Stop the Toad Foundation is very damaging to preventing cane toad entering the Kimberley. “In my opinion the Government and Stop the Toad are getting ready to cut and run following their failure on the cane toad issue and in doing so they may well attempt to denigrate the fine work of the Kimberley Toad Busters,” he says. “The Kimberley Toad Busters have always been aware they needed to slow the spread of toads until other control measures could be introduced, and I believe the Federal Government is pouring a million dollars a year into this research. To have the State Government and its’ spin kings looking for a back door to run out of will damage the fight and have a devastating impact of volunteers. They have done the cause an incredible disservice,” Mr Thomas says . With only four weeks remaining before the wet season sets in again the KTB volunteers and DEC are in a race against time and need a concerted injection of hands-on assistance and financial support. The Western Australian Government will have the blood of our native animals on its hands if it refuses to put its money at the front line instead of into public relations stunts. Call Friends of the Kimberley Toad Busters to find out how you can be part of saving WA from the cane toad. 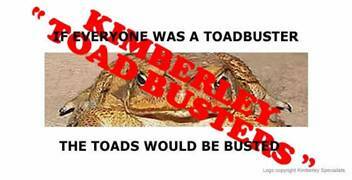 For more information contact Sandy Boulter at Friends of the Kimberley Toad Busters on 0427 508 582.